This Bandini (#358) is one of 46 known Bandinis in the world today and is the only Siluro (torpedo) with a Series 2 twin cam engine. This engine produces 71 bhp and because the car only weighs 750 pounds, it has amazing acceleration and has been timed at 115 m.p.h. It retains all of its original metal and the engine is original to the car. The car was imported to the U.S. in 1958 by T.B. Davis of Dallas Texas. Its first documented race was the November 15, 1959, Daytona National Championship race with Hugh Grammar driving for Davis. It was then bought and campaigned by Hugh Grammar in the SCCA Southwest Region until 1964. It won that championship from 1961 to 1963 and finished second in 1964. Its last known race was the November 14-15, 1964 Riverside Road Race of Champions. 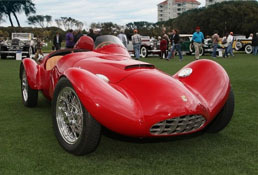 It is in concours condition and just won an award at Amelia Island and also won an award at Pebble Beach in 2002.